Every Council has its own coat of arms which in most cases is very complex displaying the heraldic devices to their fullest. We at Rowan Heraldic Shields/Wall Plaques recognise the importance of re-producing a coat of arms in exact detail, this is our expertise, which has helped us to deliver excellent results over the years and gain a massive amount of customer satisfaction which we are very proud of. We supply Heraldic Shields/Wall Plaques to County Councils, Borough Councils, City Councils, and Town Councils etc. Heraldic Shields/Wall Plaques are used for many different purposes in councils such as promotional campaigns, promotional gifts, awards, trophies, presentations, mementos etc. Many Heraldic Shields/Wall Plaques are given away as gifts/mementos to other council members, and also to visitors from around the world. 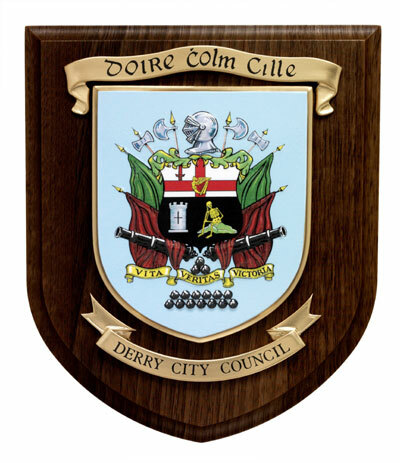 A good example is Derry City Council (see image on left) who have been ordering Rowan Heraldic Shields/Wall Plaques on a regular basis now for over 7 years, displaying their detailed coat of arms in a most attractive and unique way. Derry City Council receives visitors from all around the world every year and presents Heraldic Shields/Wall Plaques to these people as a gift/memento of their stay.